I have used several Lotus Herbal products but never tried any face pack from them. 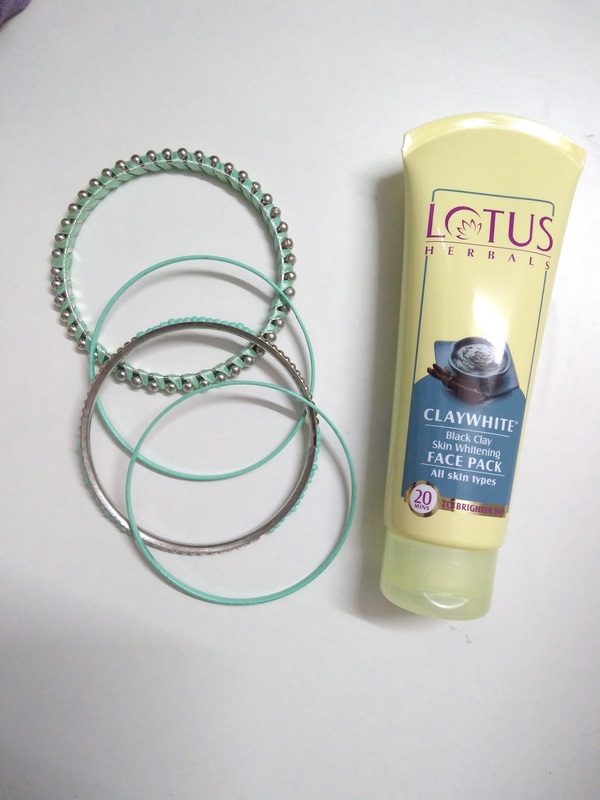 For Lotus Herbals Claywhite Black Clay Skin Whitening Face Pack, I had few doubts since this is my very first clay face pack. 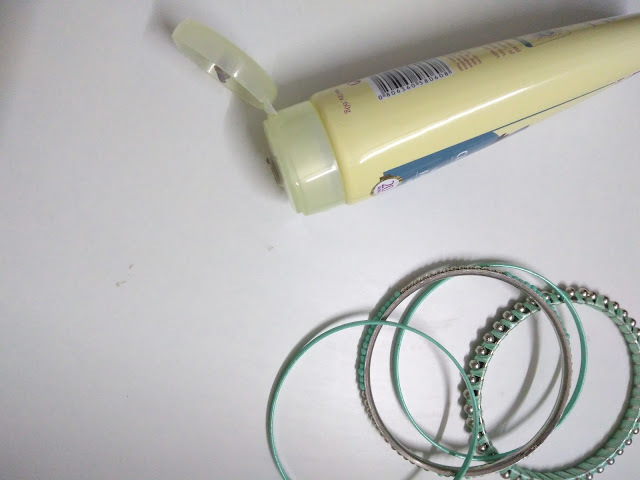 I generally use multani clay for face pack and not the ones that come out of tube. After hearing many good things about this clay mask, I had to try this. I am right now suffering from slight bumps on my skin which tends to break out every now and then. So thought, this my help in cleaning out the impurities and brightening the skin. Let's read more in the review! 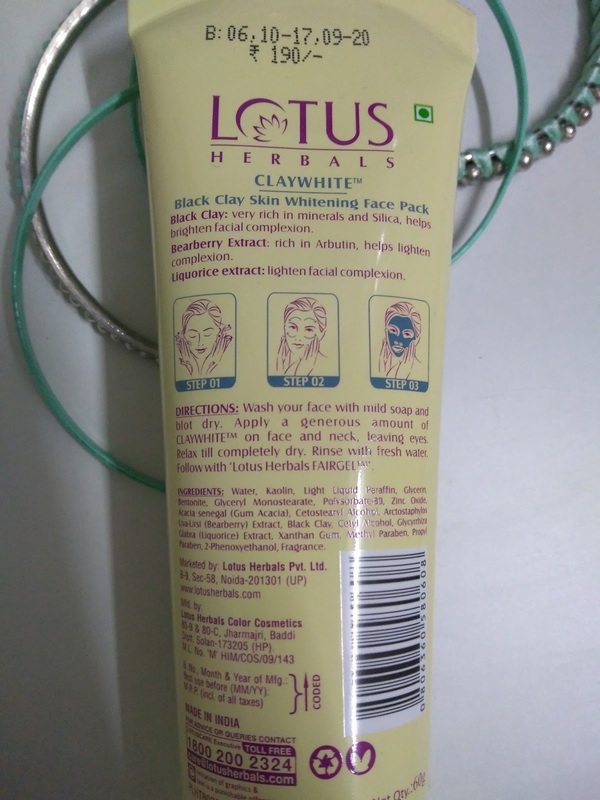 Lotus Herbals Claywhite Black Clay Skin Whitening Face Pack is the herbal skin whitening face pack consists of silica and minerals as its main ingredients. It consists of liquorice and bearberry extract which is rich in arbutin that lightens and brightens up the skin complexion. This face pack helps in reducing skin tanning and has fresh and clay like muddy fragrance. It removes the skin impurities and dirt and clear the clogged pores. This face pack dries out quickly and absorbs surplus oil and has no side effects. It is highly recommended for oily skin. It is clinically certified by dermatologists to be mild on skin and anti-allergic effect. It is enriched with essential minerals and brightens the facial complexion. Black Clay- Cleans skin, unclogs skin pores, absorb skin sebum. Bearberry Extract- Suppresses melanin formation results in skin whitening & de-pigmentation. Liquorice Extract-Suppresses production of melanin & results in skin whitening. It comes in sleek tube with flip open cap. You can easily take out required amount and use it without making any mess. Wash your face and blot dry and apply a generous amount of claywhite on face and neck, leaving eyes and relax till completely dry. Rinse with fresh water. I use very few face packs as they tend to make my skin break out and irritate it. But Lotus Herbals Claywhite Black Clay Skin Whitening Face Pack seem to suit it a lot. There was not much irritation apart from slight tingling effect. It took more than 20 minutes for the pack to dry but once it was dry, it was easy to take off. You might have to work a little for taking the clay off. It cleaned out all my pores and impurities perfectly without making my skin dry. Loved the brightening effect. I have used it for about thrice now and it is making my skin look better. I had few bumps on my skin and it helped in exfoliating them, reducing the visibility. I will keep using this clay mask in future. Share your experience with Lotus Herbals Claywhite Black Clay Skin Whitening Face Pack with me in the comment section below!